Wednesday. Humpday. Staring down an empty stomach and a pledge to friends that I’d create a hashcapade at their casa. Thankfully, I’m resourceful and consult my List of Celebrity Chef Hashes! Hmmmm, Ina Garten’s Basil Chicken Hash catches my eye, but so does Cat Cora’s Balsamic-Glazed Duck Breast Hash. After a quick consultation with Mike, the Barefoot Contessa wins – nothing fancy and it needs to go with beer…lots of beer! 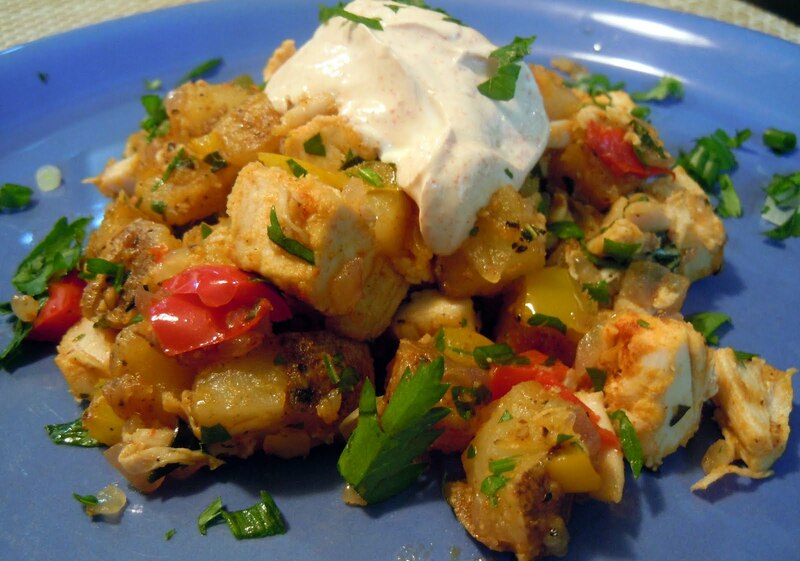 Basil Chicken Hash at Chez Tierney – Delicious! 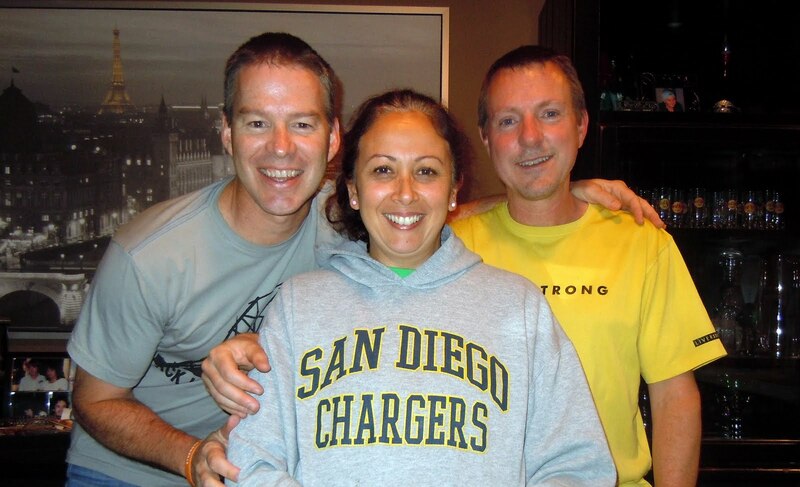 You see, my friends, Mike and Mary, hosted a Hood to Coast pre-meeting last Saturday. My contribution was a keg of Widmer Drop Top Ale, which I had won at a silent auction, Taste of the Nation – Portland. (Check TasteStrength.Org and their wonderful programs so that no kid goes hungry.) Needless to say, our team of 12 plus other invitees barely made a dent in the keg! Thus, the Drop Top and Basil Chicken Hash pairing. Yusss! When I arrived, we retapped the keg and relaxed a little before tackling Ina’s creation. After a few pints, it was time to sharpen the knife and get to work. My deal was simple: I’ll cook, you clean – easy! We chatted while the fresh ingredients were hashed and minced into submission, destined for a colorful, fresh melange of decadent hash! Amazing what a sharp knife and decent veggies can do! His Hashness, Lord Clark; The Dutchess, Lady Mary; and The Duke, Lord Cap’n Spanky! Needless to say, my adaptation* was a big hit as we drank more beer and wine. In between bites and sips, we talked about nutrition. We talked about healthcare. We talked about running Hood to Coast. Five hours later, we were no closer to finishing the beer, but we had solved most of the world’s problems! What a lovely Humpday Hashcapade. Thanks, Mike and Mary! * I used (1) shredded rotisserie chicken, 3 Tbps fresh chopped basil, a drizzle EVOO and mixed together and let sit for the basil-chicken combo. Also, I only used 1 1/2 big Russet potatoes, 1/2 red and 1/2 yellow bell pepper; 1/2 red onion and 1/2 sweet onion; used smokedpaprika; and omitted the tomato paste. I cooked all of this in one pan in stages. 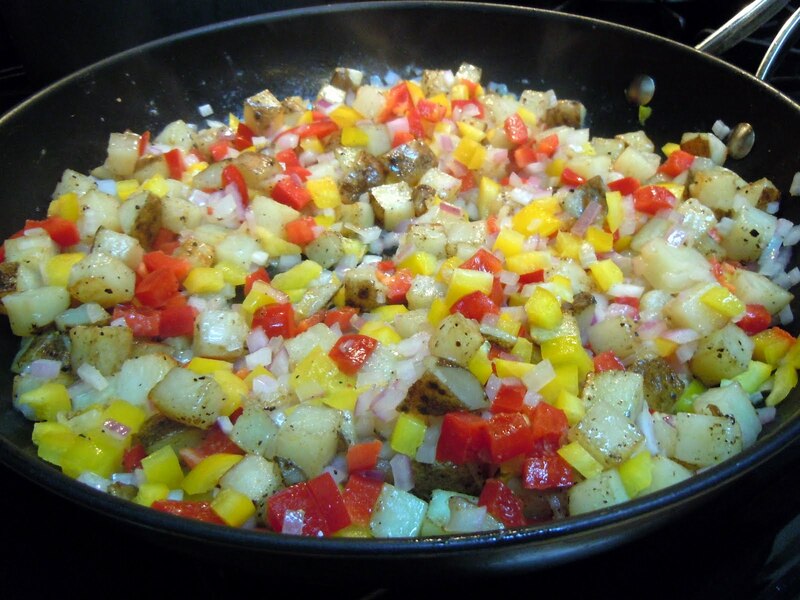 Potatoes for first 15 minutes, add onion for 5-10, add peppers, then chicken. This still made 4 servings!